This entry was posted on May 10, 2012 by Sports Traveler. Its only May 10th and we have already had an incredible year in baseball. Thanks to Phillip Humber we have seen the 21st perfect game in MLB history, and on Tuesday night Josh Hamilton belted 4 dingers in one game to become only the 16th player to do so. These two incredible achievements have never been accomplished in the same season until now. In addition, Angels pitcher Jered Weaver pitched the 10th no-hitter in Angels franchise history on May 2nd. This is the second no-hitter for the Angels in as many years. Ervin Santana hurled the other no-hitter on July 27th of last year. In other historical news, Jamie Moyer became the oldest player in MLB history to win a game at 49 years old. Both Texas Rangers' outfielder Josh Hamilton and Los Angeles Dodgers' outfielder Matt Kemp have started 2012 on a tear. Hamilton is currently leading all triple crown categories in the AL and Matt Kemp is leading in home runs and batting average in the NL. Kemp is also tied for second in RBI's with 27 and only 3 behind his teammate Andre Ethier. Pitching-wise, previously mentioned Jered Weaver is off to another great start in 2012. He currently leads the AL in wins with 5 and is second with a cool 1.60 ERA. To this point Weaver has only allowed 30 hits in 50.1 innings pitched and already has 2 complete games. In the NL, 24 year old Cardinals pitcher Lance Lynn has had a positively surprising beginning to his season. The second year player currently leads all NL pitchers with 6 wins, going perfect in his first 6 starts. He is also sitting at third in the league with a 1.40 ERA. It may be early but the great performances through this part of the season have me excited and already looking forward to the clash of MLB superstars this July in Kansas City. 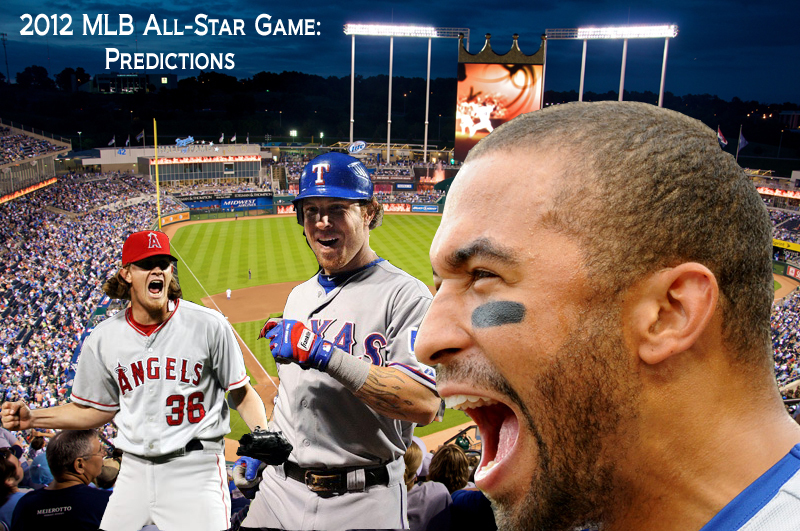 So in the spirit of the 2012 season I present my projected starters for the AL and NL All-Star teams. *Please note that the actual starters are chosen by fan vote. A practice that I find completely ridiculous and respectfully ignored when predicting the All-Star starters. These are my starters if this distinction was only awarded by merit. For those of you who want to cast a responsibly completed All-Star ballot, voting has already started. If you are interested in attending the 2012 MLB All-Star game in Kansas City, check out our available ticket and travel package options!